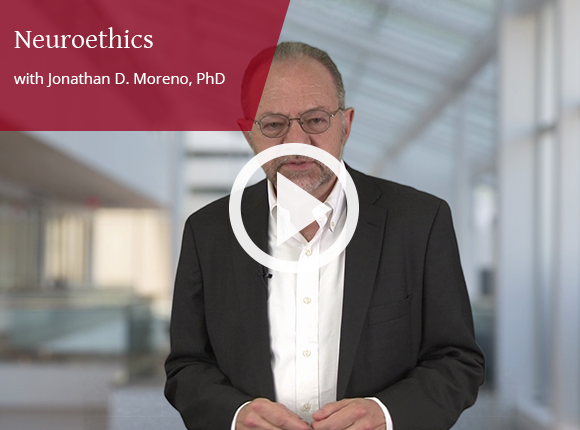 Neuroethics examines the history and philosophy of the ethics of neuroscience research. It takes a topical approach, addressing key issues in neuroscience fields including the problem of incidental findings, the representation of neurological breakthroughs to the public, and the role of devices and chemicals in closing neurological deficits and potentially enhancing the brain. How do we define brain enhancement, and under what conditions can it be ethical and just? What are the obligations of researchers in cases of incidental findings? What are the implications of neuroscience breakthroughs for law, culture, national security, and the notion of individual identity? In this activity, learners will engage with the content by moving through a series of brief video lectures with links to related readings and quizzes. Each lecture includes a list of suggested readings that provide more detail about what was discussed. Links to external readings will lead you to an abstract or, if available, the full article. This activity is co-provided by the Perelman School of Medicine at the University of Pennsylvania and Penn Medicine Nursing. This continuing education activity has been designed for investigators, research team members, physicians, nurses, and other healthcare professionals who have an interest in the history and ethics of neuroscience. Successful completion of this educational activity and receipt of certificate of credit includes achieving a minimum score of 80% on the post-test. To view English captioning, select the CC button on the video player. To watch at a faster or slower playback speed, select the "Click to view directly on the web" link and select the appropriate link. Android and iOS devices may display closed captions inconsistently. For the best mobile experience with captions, we recommend logging in using Chrome or Firefox mobile, and viewing videos through the embedded Canvas player rather than directly on the web. After you have completed the above steps, proceed to completion of the post-activity survey. A passing score of 80% is required. Evaluate the course using the brief survey on the last page. You must complete the post activity evaluation to receive your certificate. The certificate will automatically generate after completing the survey. Jonathan D. Moreno, PhD, is a Penn Integrates Knowledge university professor at the University of Pennsylvania, holding the David and Lyn Silfen chair. He is also Professor of Medical Ethics and Health Policy, of History and Sociology of Science, and of Philosophy. In 2013 his online neuroethics course drew more than 36,000 registrants. Dr. Moreno is also a Senior Fellow at the Center for American Progress in Washington, DC, and the author of several books on national security, science, and ethics, including Mind Wars: Brain Science and the Military in the 21st Century and The Body Politic: The Battle Over Science in America. He is an elected member of the National Academy of Medicine and is a National Associate of the National Research Council. He has served as a senior staff member for three presidential advisory commissions and as an adviser to many non-governmental organizations. Dr. Moreno is the U.S. member of the UNESCO International Bioethics Committee. Dr. Moreno received his PhD in philosophy from Washington University in St. Louis, was an Andrew W. Mellon post-doctoral fellow, holds an honorary doctorate from Hofstra University, and is a recipient of the Benjamin Rush Medal from the College of William and Mary Law School and the Dr. Jean Mayer Award for Global Citizenship from Tufts University. In 2014 he was named to a three-year term as an honorary Visiting Professor in History at the University of Kent in Canterbury, England. The Perelman School of Medicine at the University of Pennsylvania designates this enduring material for a maximum of 1.0 AMA PRA Category 1 CreditTM. Physicians should claim only the credit commensurate with the extent of their participation in the activity. This activity has been designated by the Perelman School of Medicine at the University of Pennsylvania for 1.0 hour of Patient Safety/Risk Management. Penn Medicine Nursing is an approved provider of continuing nursing education by the Pennsylvania State Nurses Association, an accredited approver by the American Nurses Credentialing Center’s Commission on Accreditation. Approval # 124-3-H-15. Penn Medicine Nursing awards this activity 1.0 contact hour. The faculty reported that there will be no mention of investigational and/or off-label use of products in this presentation. There was no commercial support used in the development of this educational activity. For CME/CNE related questions regarding this activity, contact the Office of CME and CIPE at Penn Medicine at penncme@mail.med.upenn.edu or at 215-898-8005. For immediate support with registration or login, contact the Canvas Support Hotline, provided by Instructure, at (844) 725-7353.